saluting the Virginia and Tennessee flaggers. Following in the footsteps of the Virginia Flaggers, and the Georgia Flaggers before them... the Tennessee Flaggers made their official debut in Elizabethton, TN, to protest the Watauga Historical Society and their blatant disregard for the honor and memory of Confederate soldiers buried at Green Hill Cemetery. In what could only be described as a phenomenal success, 24 Flaggers made their way to Elizabethon on a balmy July Saturday. We gathered first in a field behind the cemetery. After a word of prayer, we marched to the cemetery, where we were joined by Elizabethton City Manager, Fred Eden, and a local news reporter. Attendees found the grounds completely overgrown and each Confederate grave covered with survey tape and orange flags. A brief ceremony was held, where HK Edgerton also shared remarks. Several of the Flaggers gave interviews to the press and we made our way out to the road in front of the cemetery. "Smile and wave" was the theme of the day. The Tennessee Flaggers had fliers printed up that described the offenses committed by the WHA and the response from the public was overwhelmingly positive. Many folks stopped to ask what was going on, and were outraged when given the facts of the situation. The highlight of the day was when Flagger Bill Dennison spotted Dawn Peters, one of the main offenders, driving by to check out the action. Ms. Peters has said… …"The Confederates lost the right to fly that flag 150 years ago. We do not want to see that Confederate Flag flying over Green Hill Cemetery, or over Elizabethon, TN." Needless to say, she got an eyeful of Confederate flags! 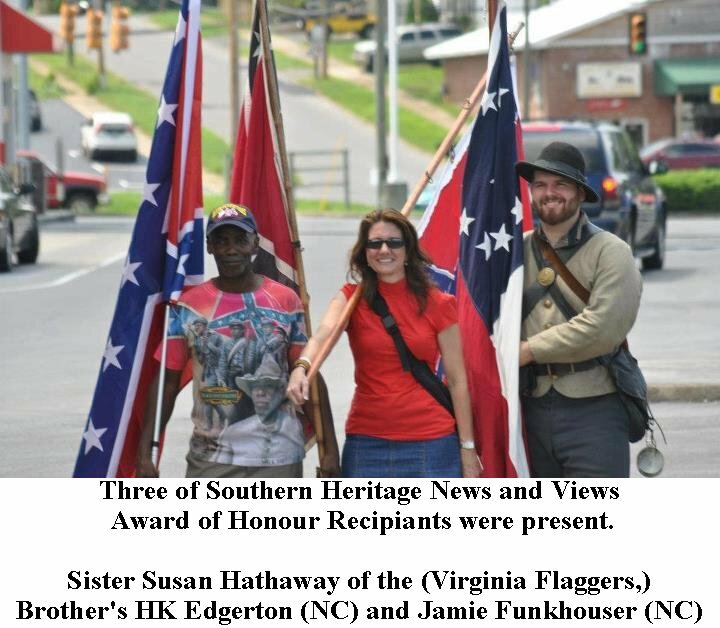 Among those who joined the Tennessee Flaggers for this inaugural event were HK Edgerton and Jamie Funkhouser of NC, and Susan Hathaway of the Virginia Flaggers. Others came from all across Tennessee to be a part of standing up for our Ancestors, and forwarding the colors. After flagging, we all met again in the field behind the cemetery, to share fellowship and suggestions for future flaggings. The day was then closed with prayer, just as it began. I had the honor and privilege of meeting one of my heroes, PoP Aaron. He and Mike Shaffer did an outstanding job in the planning and implementing of this event, as well as the organizing of the Tennessee Flaggers. All involved were excited to be there and thrilled at the outcome. I pray that this will be the first of many flaggings for the Tennessee Flaggers and that others across the South will pick up their flags…and STAND, FIGHT, AND NEVER BACK DOWN! God bless the Tennessee Flaggers! Elizabethton, Tennessee is one of the cleanest cities and the most Friendly folk I have ever Flagged or protested in. We had absolutely nothing negative said or done toward us. We had many ask questions and truthful answers were cheerfully given by our Flaggers... 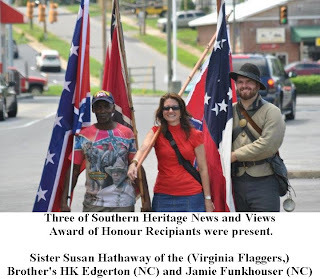 Many residents were unaware of Watauga Historical Association's attacks on our Confederate dead and our flags.... Some even ask for flags and joined in with us. Turn up the volume and the conversations are audible. Got what it takes to be a Tennessee Confederate Flagger! ?